In developing my Twitter application, I decided that I needed to know how many users the average Twitter user follows. To accomplish this, I started a poll which was a pretty sad failure. Only 5 people responded and two of them were myself and my wife. However, all was not lost. As part of my Twitter application, I cache lists of who a user follows. (This helps reduce my impact on Twitter’s servers.) I checked and I had over 10,000 users’ information cached. So I wrote a quick script to query that information. The results were quite enlightening. 90.33% of users follow 2,600 people or less. 75.67% of users follow 1,400 people or less. 51.14% of users follow 500 people or less. 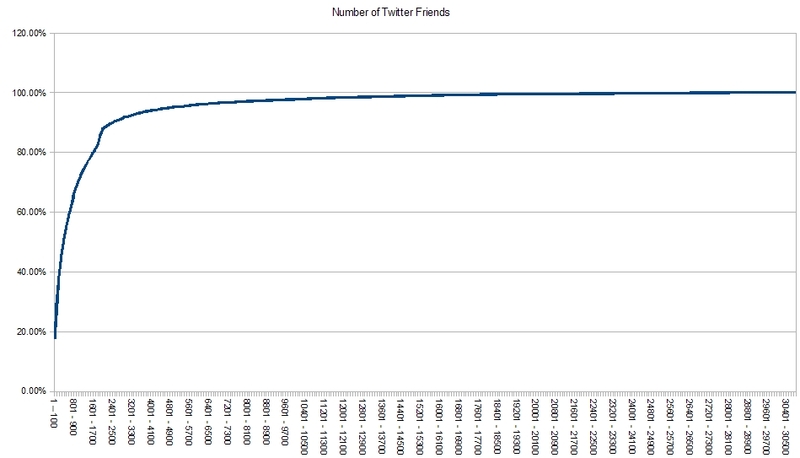 As you can see, the percentage of users climbs sharply until around 2,500 followers. Then it levels off for a slow ascent to 100%. This really helps me. If I make my application cut off checking the Friends list at 2,000 people, it will handle the complete lists for 85% of users. I’m willing to have partial functionality for the top 15% of users (who are likely to not need my application as much) to preserve functionality for the bottom 85%. If you’re interested in more data from this, let me know in the comments below and I’ll see what I can do.